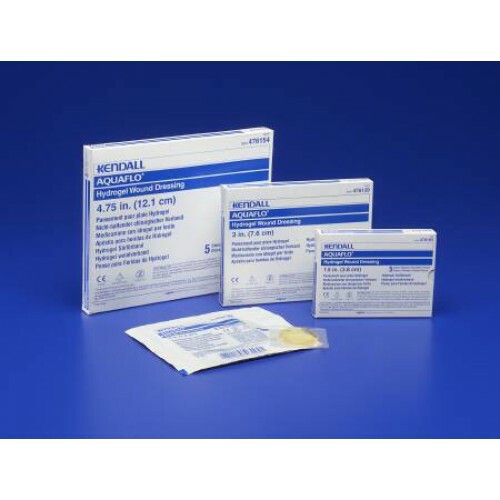 Aquaflo Dressing are Hydrogel Dressings and Transparent Dressings used for Wound Care. Aquaflo Hydrogel Transparent Dressings are designed with an advanced formulation that is highly absorbent and does not dry out. Manufactured by Kendall, Aquaflo Hydrogel Transparent Dressings maintain a moist wound environment to promote faster healing. The shape of the Aquaflo Hydrogel Transparent Dressings is circular or disk shaped to maximize wound coverage. 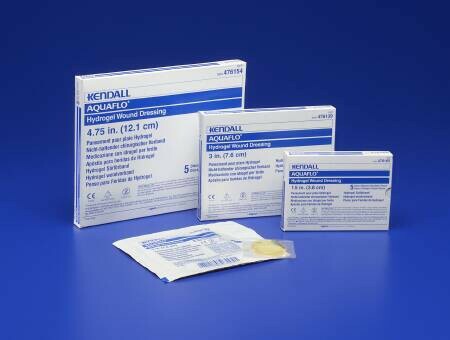 The Aquaflo Hydrogel Disc Shaped Dressing fills shallow cavities and protects the wound. Patients using Aquaflo Hydrogel Transparent Dressings experience longer wear times and require less dressing changes. Aquaflo Hydrogel Transparent Dressings may be customized to the actual wound size by cutting to size. The Aquaflo Hydrogel Dressing is developed with a translucent gel that allows for wound visual inspections. Dressing changes should occur every 1 to 7 days, depending upon the amount of wound drainage. Caregivers do not need to remove the dressing to inspect healing progress of the wound. Kendall Aquaflo Hydrogel Transparent Dressings provide a cooling sensation upon dressing change that helps reduce pain. Aquaflo Hydrogel Transparent Dressings do not cause wound trauma upon dressing removal. Cooling sensation reduces pain upon dressing change. Absorbent dressing that provides moist healing environment and will not dry out. Unique disk shape maximizes wound coverage and helps fill shallow cavities. This hydrogel dressing is transparent so that you can monitor the wound. Caregivers do not have to keep changing the dressing as often.